– Rematch clause– there was rematch clause in the contract but it only worked for Joshua. If Wilder won, then the rematch clause would kick in and Joshua could force a rematch. However, if Joshua won the fight, then he could move on without giving Wilder a second fight. In other words, it wasn’t a rematch clause in the true sense of the word. It was only a rematch clause that worked for Joshua. It’s not surprising that there isn’t a rematch clause for Wilder, as Joshua is the A-side and he’s looking to use all the advantages he can get for his side. Stacking the deck in Joshua’s favor is par for the course in boxing when it comes to fighters using their A-side muscle. It’s not a good deal for the less popular fighters because they’re put in a position where they don’t get a chance to force a rematch if they’re robbed of a decision. – No date or venue – Just why Hearn wouldn’t give a date or a venue for the Wilder vs. Joshua fight is unclear. You would think that Hearn would at least include that important information. 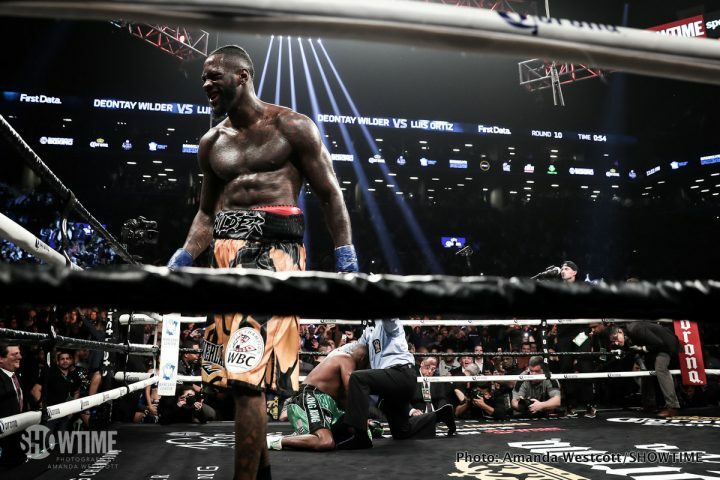 Wilder, 32, is very angry at not getting the fight with Josua, as he was looking forward to knocking him out and capturing his IBF, WBA and WBO heavyweight titles. It’s no longer business with the 6’7” Wilder. It’s personal. He wants to hurt Joshua and put him in his place for his dragging his feet and not agreeing to the fight. Wilder’s goal is to win his next 11 fights to take his record to 51-0. He wants to beat out Floyd Mayweather Jr’s 50-0 record before he retires from boxing. Mayweather won his 50th fight against UFC star Conor McGregor, who came into the fight with a 0-0 record. Wilder isn’t going to look to make it easy on himself by picking out novices to win his next 11 fights. He wants to beat out Mayweather’s record the hard way by taking on the best talents in the division and defeating them. It’s about having a true legacy for Wilder, not about padding his record with wins over horrible opposition with virtually no chance of beating him. That’s why Wilder defended his World Boxing Council title against Luis Ortiz in his last fight in March. Ortiz is seen as the third best fighter in the sport by many fans. Wilder’s win over Ortiz proved that he’s willing to fight the best. For some reason, Joshua’s promoter Hearn never matched him up against Ortiz. I don’t know why, but some fans think Hearn was afraid of Joshua getting beaten and him losing his gravy train fighter. I’d hate to think Hearn had Joshua dodge the fight with Ortiz for fear he’d lose the fight. Joshua has only fought one good fighter during his career in Joseph Parker, and that fight was highly controversial due to the referee preventing inside fighting. Joshua’s win over 41-yar-old Wladimir Klitschko last year wasn’t a good one because the Ukrainian fighter was old, past his prime, coming off of a one-sided loss to Tyson Fury and hadn’t fought in two years. Wladimir’s last fight before facing Joshua was in 2015. Hearn had been bellyaching for the last two weeks about Wilder’s team not agreeing to the contract that he sent them, but without a date and a venue for the Joshua-Wilder fight, who can really blame them? It’s insane that Hearn didn’t include that information in the contract because it should have been there. Povetkin’s promoters Andrey Ryabinskiy and Vadim Kornilov are ready to go ahead and put together a deal with Joshua for September. Povetkin earned the right to be Joshua’s World Boxing Association mandatory challenger by beating Christian Hammer last December. It wasn’t much of an opponent for the 38-year-old Povetkin had to beat for him to cement himself in as the WBA mandatory, but that’s how it goes for the heavyweight division. The division is incredibly weak right now, and it generally doesn’t take much for a fighter to become a mandatory challenger to earn a title shot. Gone are the days where contenders had to fight talented guys to get title shots at heavyweight. Nowadays, it’s often the case where a fighter can beat a mediocre guy and be made the mandatory.